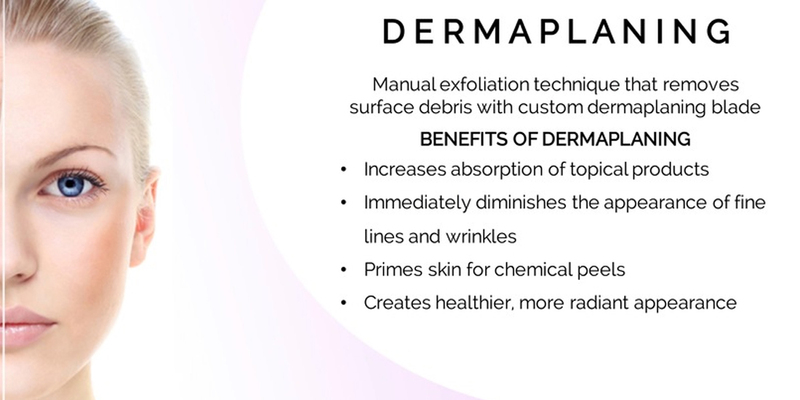 Dermaplaning is a method of exfoliation that is performed by using a blade to gently scrape off the top layer of dull and dead skin cells in order to reveal a smoother, brighter complexion. It can be combined with a peel for even more exfoliation. Dermaplaning is a favorite in the makeup and film industry because it also eliminates the peach fuzz that cakes up in makeup and causes an uneven rough appearance. Dermaplaning also allows for greater penetration of skincare products and creates a flawless canvas for makeup to glide on smoothly. Wondering if you should try dermaplaning versus microdermabrasion ? They are both forms of physical exfoliation, but the methods are very different. Microdermabrasion sands and suctions dead skin cells, which also helps to uproot clogged pores around the nose, mouth and chin. Dermaplaning safely scrapes off the top layer of skin, so it is well suited for drier skin types and anyone who wants to get rid of peach fuzz. But, keep in mind, both methods are good for almost everyone and our expert aestheticians will let you know which they feel would work best for you. Want both? Well the good news is that you can do them together in our Microderm/Dermaplaning Combo treatment. Dermaplaning is recommended for all skin types except for those with active acne. If you have deep cystic acne, wait until breakouts are clear before trying this treatment. As always, also discuss any allergies or skin sensitivities before starting a treatment.